Next week, I’m lighting “Dinner”, by Moira Buffini, at the Network Theatre underneath Waterloo Station in London. That’s Tuesday 16th October to Friday 19th October – doors open at 19:00 for 19:30, and tickets are £11 from Ticketsource. Click here to download the flyer in PDF. The lighting won’t be anything particularly fancy, but then this really isn’t the play for it – so if you were thinking of going to this play to see the lighting, wait till my next one! Instead, go to this one for the acting. And the lobsters. 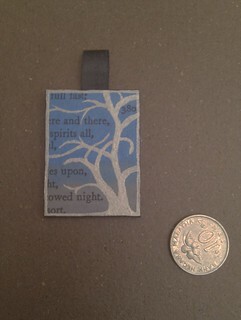 I’ve been making quite a few of these lately, from an old copy of Midsummer Night’s Dream rescued from the recycling. It’s the same technique I’ve been using for pendants, layered artists’ mountboard sealed with acrylic & varnish; the colours are Talens Ecoline watercolour inks, which I’m really falling in love with. 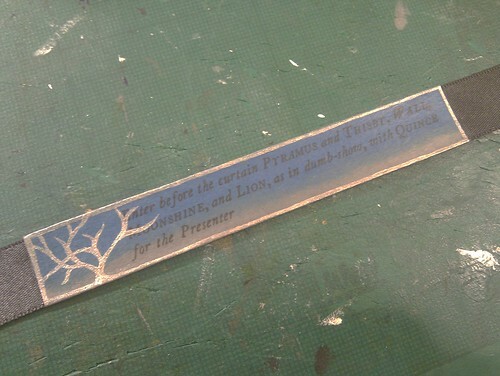 The cheap paper (it’s a Wordsworth Classics edition) takes the ink really nicely, it turns out. Bare trees echo the play’s message that time is out of joint, and each one tries to respond to the partial quotation highlighted on it. Most have been going to friends, or as auction pieces for good causes (speaking of which: if you have a good cause, and are holding an auction, drop me a line) but I may be selling a few as well. 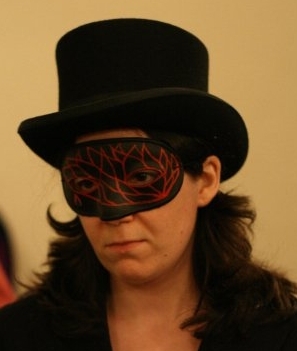 I made this one for a reading of Marlowe’s Dr Faustus. Everything went well; we had a capacity crowd (in fact, some people who wanted tickets were disappointed) and plenty of enthusiastic volunteers to read. Note to self: be more thorough about working out timings next time. Still, spending more time than expected in the pub with theatre types is always good, and the unexpected folk session afterwards was unexpected and also good. Theatre, and not particularly related to the visual arts, but I want to talk about it anyway and make the script public. On the evening of the 26th of March, I’m running a play reading in Westminster Arts Reference Library – originally scheduled as part of LGBT History Month, but various exigencies meant we had to change date & venue. Addendum: there’s an open-access Facebook event here, for those of you who use Facebook. Sadly, the venue is not wheelchair accessible – it’s a Victorian building with three flights of stairs, and we’re at the top. It’s not ideal, but it’s the venue we’ve got. This is in some senses a hilariously bad play, consisting mostly of entirely un-dubious language and arbitrary plot developments, and in others it’s really good. It’s a political satire with bisexuality and dancing demons! The original script is here, and the PDF version I’ve prepared to use on the evening is here. I prepared it using Scribus; the font is StrangeNewes, by Feòrag NicBhrìde, while the title page is done in Chapbook, also by Feòrag. Last night, I went to see Shaw’s play Major Barbara at the National Theatre (Wikipedia, Gutenberg) along with Web Cowgirl and a few others. It started fairly badly for me, but then that was due to my taking a while to click with Shaw’s abstractionist speechifying (I kept wondering if Lady Britomart was about to say “Your father, who as you know is a noted manufacturer of cannon”) as anything else. Except the lighting design. The stage at the Olivier is absolutely bloody enormous, a huge black cavern of pure theatre, and in order to convey the right warm, familial, and slightly stifling atmosphere of Lady Britomart’s lounge they’d placed an Edwardian living room on a rostrum in the centre. And hung a huge practical chandelier over it, with more than a dozen lit bulbs. This would have looked OK if we’d been in the stalls, but at the back row it meant that we were looking down on the chandelier as much as on the actors, and it was really annoying. Having practical (theatre term meaning ‘actually works the way a real one would) lights on stage is, sadly, extremely stupid. It’s a nice trick that always appeals to nontechnical directors, but it never works the way they want because real lights are nowhere near as powerful as theatre lights, and don’t light actors to be seen in any case. Rule 3 of theatre lighting runs thusly: You point the bright end at the side of the actor facing the audience. It’s something a lot of lighting designers have trouble with. There’s a corollary to the Rules which says: Lights are not a decorative element. Like most corollaries, it’s open to debate, creative misinterpretation, and downright breakage, but fundamentally, if the audience end up looking at the lights then yer doin it wrong. Thankfully, that only lasted for one scene, and the design of the rest of the play was absolutely superb. The bowels-of-the-machine scene, in the Undershaft works at the end, was beautifully done, with moving trusses delivering rank upon rank of artillery shells to the accompaniment of industrial noises while the scene change took place.